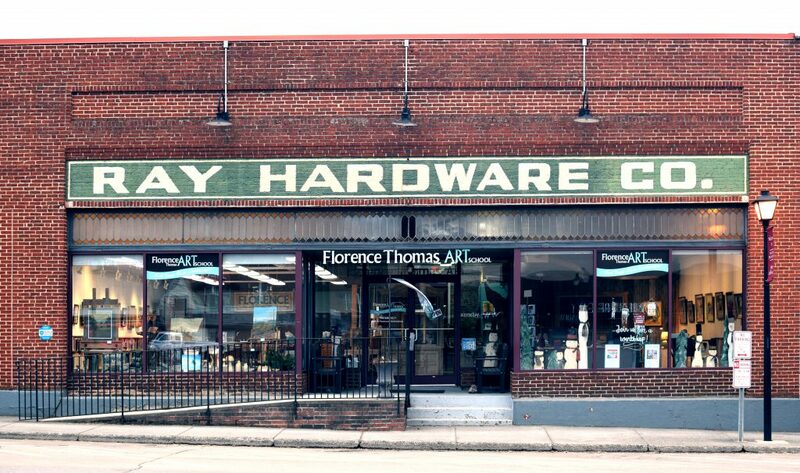 Downtown West Jefferson is home to the Florence Thomas Art School, now celebrating its 10th Anniversary in Ashe County. The school offers classes on subjects as varied as making barn quilts, a variety of painting techniques, wool dying, writing and basket making (to name a few). The sun-filled building is brimming with beautiful art that’s worth checking out. The school joins the Ashe County Arts Council (Celebrating their 40th anniversary! ), in making the arts a focus for our Blue Ridge mountain community. Both offer interesting events and participate in the Gallery Crawls, held June to October on the second Friday of each month in the downtown West Jefferson area. In celebration of a decade since its founding, the exhibit during the fundraiser will be the work of the late Florence Thomas. Born in 1909 into a way of life we’d hardly recognize today, Florence produced a bounty of work documenting life in the mountains. A believer in paying it forward, Florence’s passion for art extended to teaching, and she spent twenty years providing classes in the basement of her home on her farm in the Grassy Creek area of Ashe County. She took it a step further. Upon her death at 98 in 2007, she left the financial means and all her remaining paintings to create the school now bearing her name. Through her legacy, Florence made art a possibility for future generations in our Appalachian mountain county. Why not book a North Carolina Mountain cabin today!